Alison Chambers reports from Geneva and a record European Business Aviation Convention & Exhibition (EBACE). The large orders and new aircraft unveilings (with the exception of Airbus and the new ACJ319neo and 320neo) may have been missing, but there was no doubt at the 15th annual edition of EBACE that this vibrant sector is on the up. Some 460 exhibitors occupied 2,200 booth spaces and visitor numbers topped 13,200. 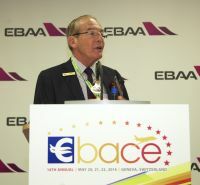 EBAA CEO Fabio Gamba highlighted that EBACE will continue to showcase in Geneva for many more years having concluded successful negotiations with the Swiss airport. The show hosted four debutantes on the static – all on course to enter revenue service by year-end. HondaJet, Honda Aircraft’s first commercial aircraft flew in as part of its world tour, supported by designer engineer/CEO Machimasa Fujino. He highlighted that the four test aircraft in the programme have to date accrued 2,500 flight hours and the aircraft is close to achieving final certification. Its North Carolina, Greensboro facility is busy with 20 aircraft in the production process, he said. Fresh from its EBACE introduction the advanced light jet set off to 10 European countries and potential customer visits. Its UK debut was Cambridge, hosted by new Northern Europe Distributor Marshall Aviation Services. Embraer’s new super-light Embraer 450 flew in fresh from Brazil, while Cessna showed off its new Latitude, under the Textron Aviation banner. First-time Bombardier’s new Challenger 650 also added to the 55-strong aircraft line up on the static. NetJets CEO Jordan Hansell presented the company’s new Challenger 350 and the sale of a Global 7000 to motor racing legend Niki Lauda who flew in to bolster the company’s PR efforts proved to be bright spots for Bombardier, which announced a change in its business aircraft leadership during the show. Its widely published cost cutting in the sector is in part due to its focus on the CSeries, observers suggested, as the OEM prepares to debut the new regional jet at the Paris Air Show this month. Other EBACE highlights included VVIP charter company Acropolis Aviation’s launch of the Airbus ACJ320neo which brought super salesman John Leahy to the show – for the first time – and Qatar Airways’ Group CEO Al Baker’s order for 20 Gulfstream jets G500/G600 and G650s, a move that will double the executive jet fleet for wholly owned subsidiary Qatar Executive. 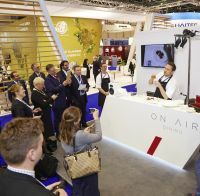 Inflight fine dining company On Air Dining brought colour and exquisite flavours to the EBACE hall with the first ever daily culinary demonstrations on the booth of Gama Aviation. Generally there seemed to be even more drinks and canapés receptions this year. The Avinode booth, host of a raft of charter operator companies, had a definite buzz. The talk at the show too was about mergers, consolidation and acquisition; long serving contractor companies that have lost business as a result of these partnerships as the streamlined groupings retrench – and who is going to be next to marry up. In January Gama Aviation and Hangar8 merged to create Gama Aviation Plc. Europe’s second largest business aviation company ExecuJet announced just prior to the show it too was joining the Luxaviation Group, a move that boosts the Luxembourg based group’s combined fleet to 250 aircraft. ExecuJet’s charismatic founder and part owner Niall Olver will now depart, leaving CEO Gerit Basson to spearhead the integration. Niall is likely to continue his dream to bring the former Grob SpN light jet project to market, with new backers. UK VLJ (Very Light Jet) operator Blink announced the purchase of fellow Cessna Citation Mustang Italian company MyJet, bolstering the joint fleet to nine. It also announced it was buying into Blackbushe Airport in the UK, its home base for the past four years. Good news for Blackbushe too, following the sad demise of resident helicopter firm PremiAir. Rizon Jet, London Biggin Hill Airport’s award winning FBO announced it is close to ratifying new ownership with aircraft financing and leasing company Lionhouse. The additional funding the new owner will provide will help the business expand with some exciting and innovative new ventures from 2018, suggested CEO Allan McGreal. Air BP CEO David Gilmour left with London Biggin Hill's Business Development Director Robert Walters. Air BP hosted a number of partner companies including London Oxford Airport and charter operator SaxonAir on its stand. It used this year’s event to honour some of its longer established clients. CEO David Gilmour was on hand to honour London's Biggin Hill (20 years’ collaboration). 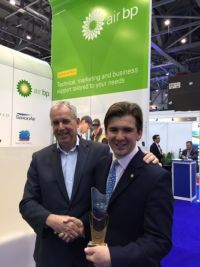 Other partners recognised included Graz (57 years), Egelsbach (56 years), Grenoble-Le Versoud and Innsbruck (46 years), all part of Air BP’s 700-strong global locations network. The African Business Aviation Association (AfBAA) continues to go from strength to strength. At EBACE it released data from the first ever in-depth survey of the African bizav sector undertaken to demonstrate just how sizeable this sector has become. Nodding to this market growth Vertis Aviation of Switzerland announced the addition to its fleet of an upgraded Boeing 727 VIP, known as the Super 27 VIP (ZS-PVX). Operated by Fortune Air and based at Lanseria International Airport (South Africa), it will serve a growing requirement for flights for Heads of State and their entourages. EBAA announced it has commissioned a new consultancy project with Booz Allen Hamilton to identify the scope of the industry and the impact business aviation has on the economy – for presentation by year-end. It follows on from the Price Waterhouse report several years ago. One of EBAA’s sessions on the last day was on perception, or rather the misperception of the sector. A recent survey highlighted that EBAA members feel that they are misunderstood by authorities, and that governments do not recognize the strong economic contribution from business aviation they deliver. Mostly, they agree, they are perceived as a luxury niche, and are taxed and regulated as such. The survey´s feedback, however, also revealed that business leaders see business aviation in a contrastingly, positive light. 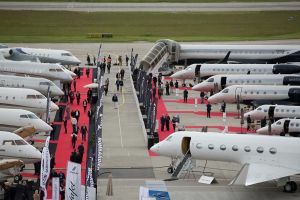 The US$30 million plus showpieces on static display at EBACE belie the notion that all business jets are simply airborne taxis. The bulk of the European fleet – over 50% and the best-selling, are actually the lightest jets and turboprops. Hardly tarmac-bling, according to Managing Director of WINGX, Richard Koe. Heading the Perception of Business Aviation session he urged the industry to simultaneously recognize both the luxury and more prosaic functionality of its services. No black and white distinction between the two is possible, given the often-overlapping motivations of business, prestige, lifestyle and leisure, he suggested. Last year, according to Wealth X, ultra-high net worth individuals spent US$79 billion on luxury services. Yet the reluctance among the industry associations to recognize business jets for luxury underestimates its appeal and scope, he opined. They cringe from the ‘luxury’ association, yet there is no such shame in the rest of the vertical market. Luxury yachts, cars, jewellery, fine art – these niche but recently fast-expanding sectors have nothing to hide. Rather, business aviation should celebrate its marriage of technical performance and refined aesthetics and make hay while the sun shines. “Just look too at the wide breadth of the cottage industries this exciting industry is supporting – as evidenced on the booths here at EBACE,” said Richard. And those are only the revenues directly associated to the aircraft. Every business jet customer that leaves the FBO/private terminals is a boon for local service providers.